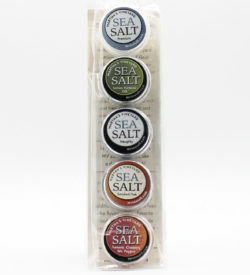 Martha’s Vineyard Sea Salt late last year, husband and wife team Heidi Feldman, a tech consultant, and Curtis Friedman, a carpenter, are bringing it back. They pump seawater into a tank, take it to their farm in Tisbury, MA, pour it into a solar-powered evaporator that Friedman built on the property and wait for the water to evaporate, leaving the salt behind. Once it’s hand-raked and dehydrated in small batches, it is wrapped in eco-friendly paper and packed in reusable sacks made from organic muslin. The briny, hard-mineral flavor of the flakes from these rocky New England shores is a hit with chefs around the country.